Can active managers improve performance by moving from relatively diversified to relatively concentrated portfolios? Doing so is likely to increase risk, shift the relative importance of luck and skill, and raise trading costs. A fourth consequence is that the probability of active underperformance is likely to increase. A simple example provides some insight. Imagine a market with five (equally weighted) stocks, whose performance in a given year is shown below. The market’s return is 18%, driven by the outstanding performance of stock E. We can form portfolios of various sizes from these five stocks. There are five possible one-stock portfolios, four of which underperform the market as a whole. Alternatively, there are also five possible four-stock portfolios, four of which outperform the market as a whole. The expected return of the complete set of one-stock and four-stock portfolios is the same 18%, but the distribution of portfolio returns is different. In this case, holding more stocks increases the likelihood of outperformance. Of course, this stylized example only “worked” because our hypothetical returns were skewed to the right; formally, the average return was greater than the median return. A different return pattern among the individual stocks would have produced a different result at the portfolio level — so the usefulness of our example hinges on an empirical question: to what degree are real-life stock returns skewed to the right? We might suspect that there is a natural tendency toward a right skew in equities — after all, a stock can only go down by 100%, while it can appreciate by more than that. 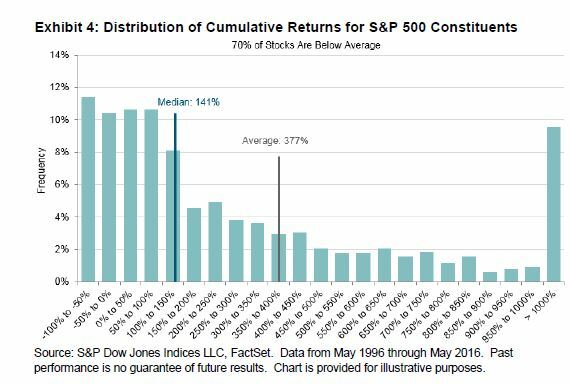 We confirmed this intuition by plotting the distribution of cumulative returns for the constituent stocks of the S&P 500 for the 20 years ended May 2016. The median return was 141%, far less than the average of 377%. This positive skew in equity returns is not simply a long-term phenomenon: in the 25 years between 1991 and 2015, the average S&P 500 stock outperformed the median 21 times. If stock returns are skewed to the right, portfolios with fewer stocks are more likely to underperform than portfolios with more stocks, because larger portfolios are more likely to include some of the relatively small number of stocks that elevate the average return. Indeed, the logic of skewed returns is that it is more sensible to focus on excluding the least desirable stocks than on picking the most desirable — the opposite of what a concentrated portfolio will do.